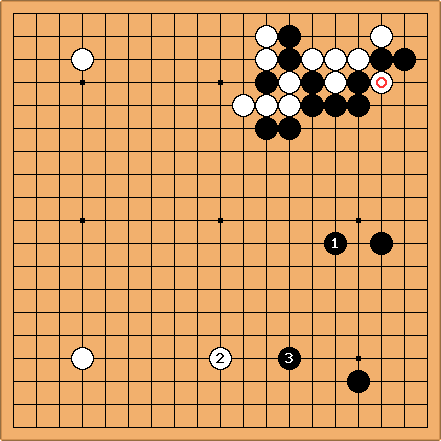 This is from a game between kyu players (game 83 from the Go Teaching Ladder). When Black played , White invaded deeply with . This threatens to use , for example by White a, Black b, White c.
According to Kim Seong-june 6d, to consolidate and control the aji of is better. If , Black is content to build up with . The preceding plays were to shown here. Kim feels that these kikashi should not have been played: Black a immediately is better. This is an example for use of kikashi to build up frameworks. Another example, this time from pro-level opening theory. 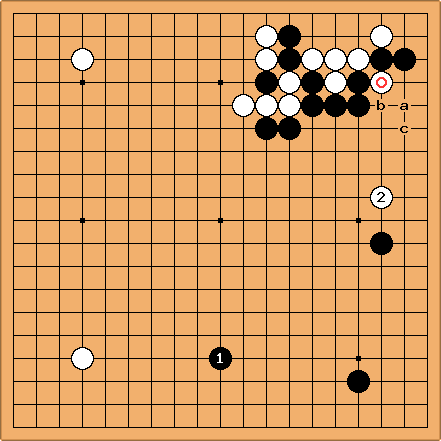 is an idea for building a mini-chinese formation later, at a, with an order of play that doesn't allow White to pincer. is a typical wedge, and by the time of she has a strong group usefully placed between two black frameworks. In most cases Black now plays at here, rather than at a (the latter has been tried by Mok Chin-seok, though). There is plenty of corner aji at b; considering the effect of that combined with White's strength above, Black prefers to secure the existing framework, rather than expand it.